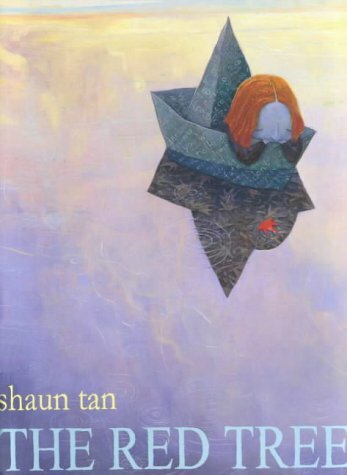 Depression is not an obvious choice of subject for a picture book but Tan's handsome, large format volume conveys this state of mind admirably via its brief text and hauntingly surreal illustrations. 'Sometimes the day begins with nothing to look forward to' the opening page tells us beneath an illustration of a girl sitting up in bed as blackened leaves fall from her ceiling and threaten to engulf her. A framed picture of a red leaf on the wall echoes the red of her hair and perhaps represents the part of her that can still sometimes see the world as a creative, warm and glowing place. She reaches that place at the end of the book when the red tree bursts into life but the journey to get through the day is harrowing. 'Sometimes you wait and wait and wait and wait and wait and wait but nothing ever happens' we are told as the girl diminishes in size in a sequence of illustrations as the perspective is pulled further and further back from her until she is invisible. The text gets smaller too and the reader winces with the pain of this invisibility that is bleakly conveyed. Fragmentation and lack of connection are seen in scatterings of letters and scraps of dictionary definitions amongst brooding landscapes. This book does not use the word depression but leaves the way open for young readers to respond to its theme with their own experiences and feelings. Many, I am sure, will find it a relief to know that there is a book that understands just how awful things can be. For all ages from about nine.